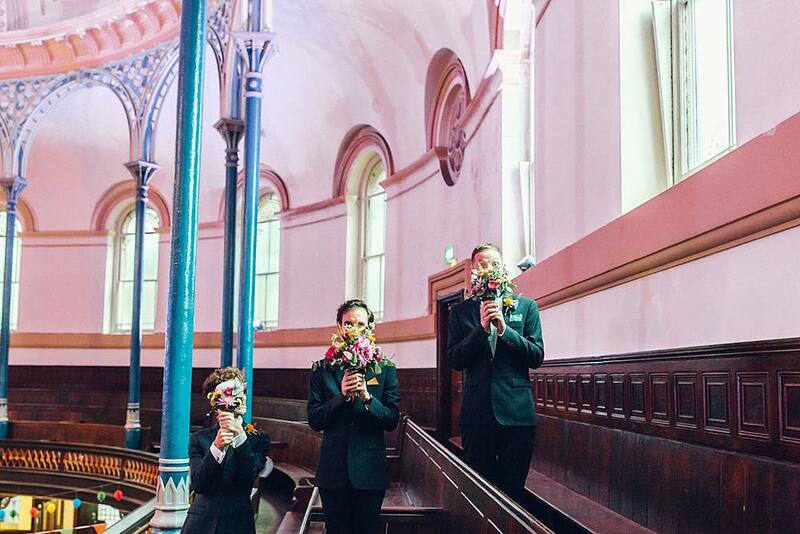 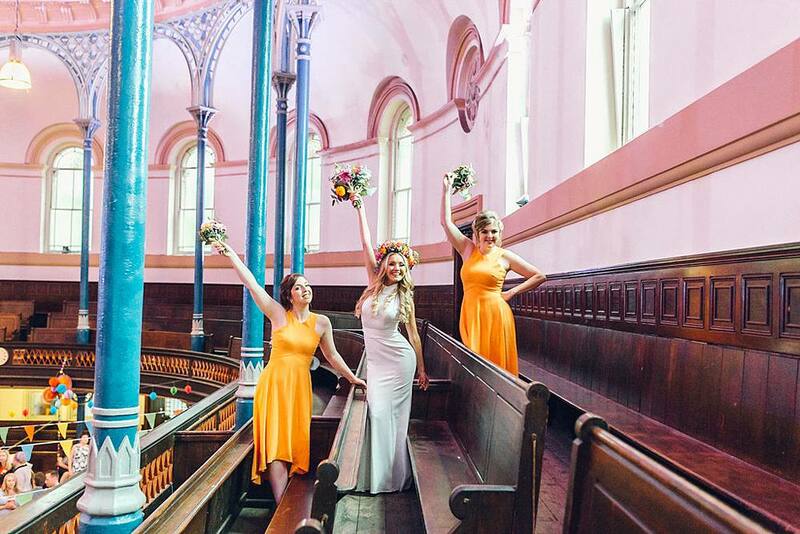 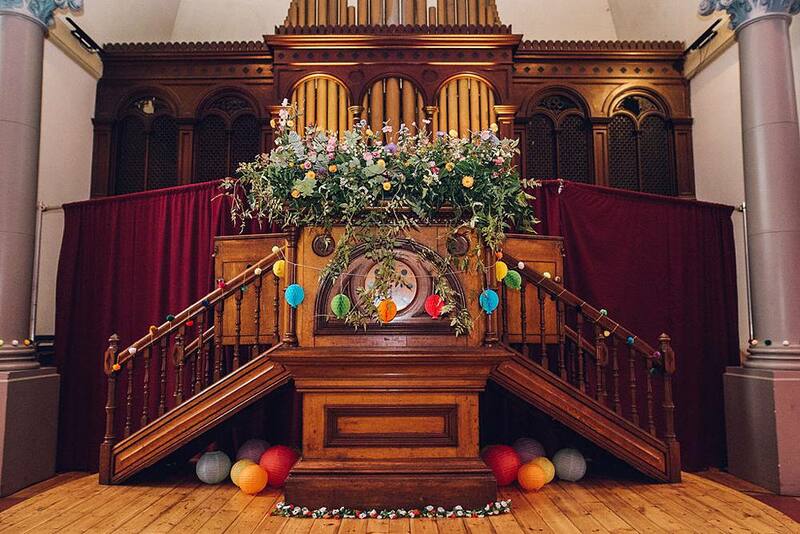 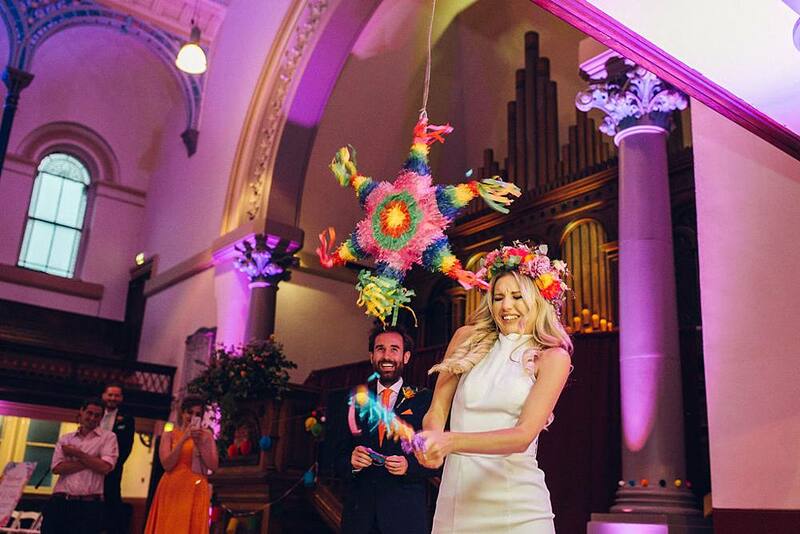 A fun, colour-fest, Mexican inspired wedding with a Mariachi band, tacos, and the most amazing flower crown at the Round Chapel, Hackney. 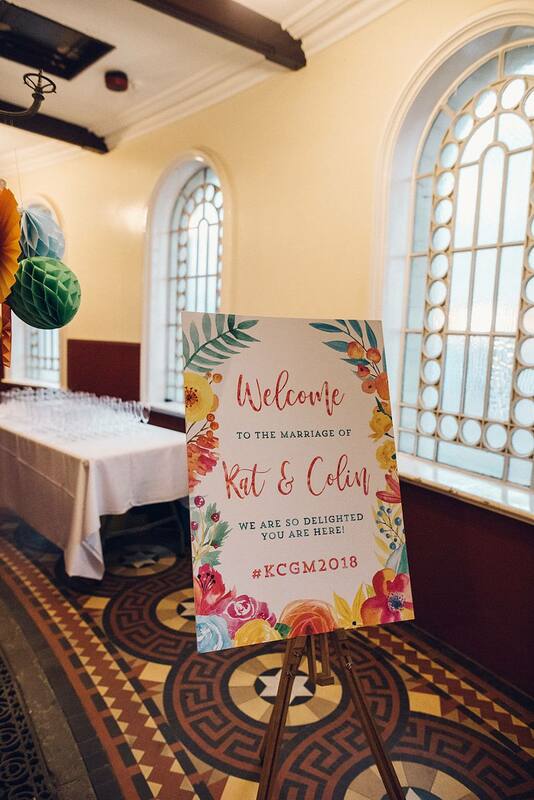 I met Kat + Colin earlier this year at a wedding fair and was delighted when they got back in touch, as I knew their wedding was going to be a fun one! 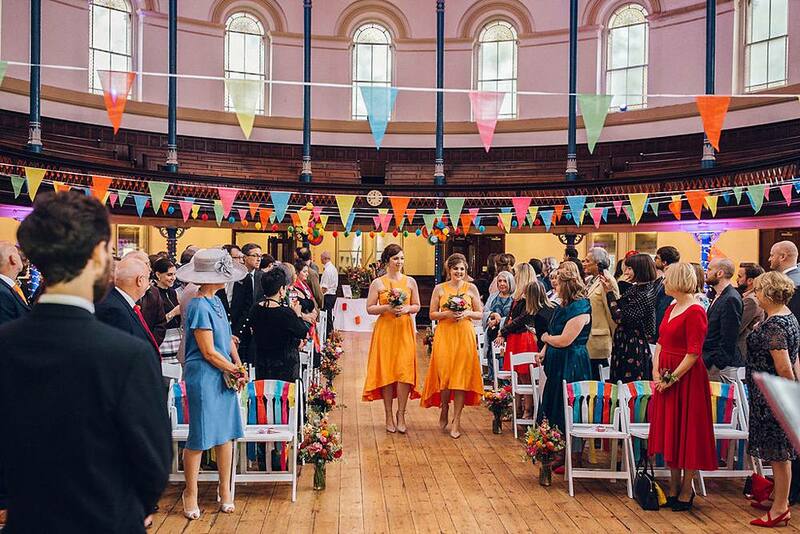 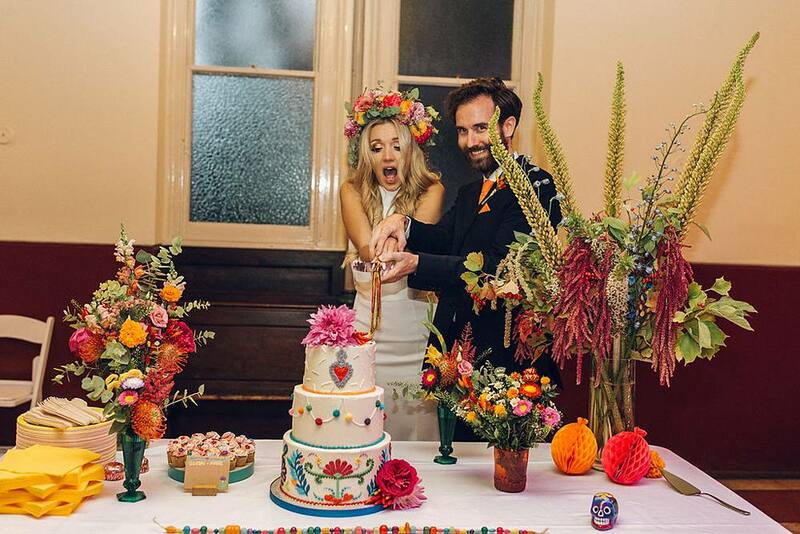 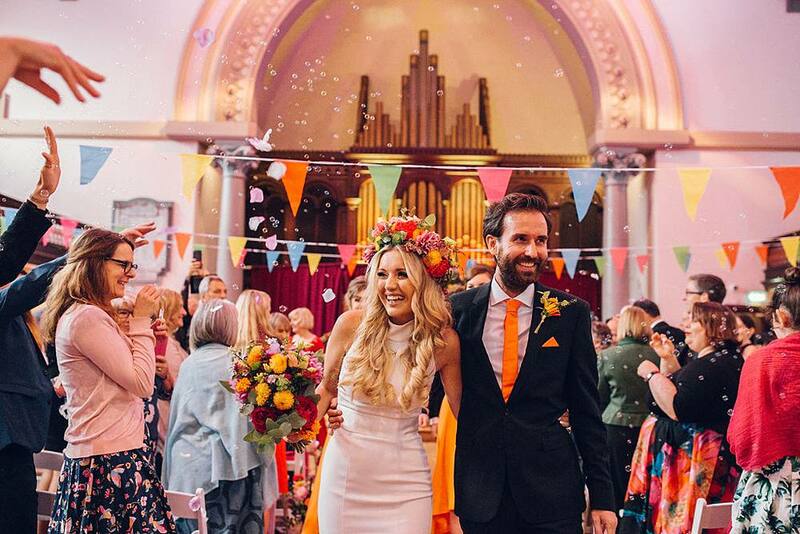 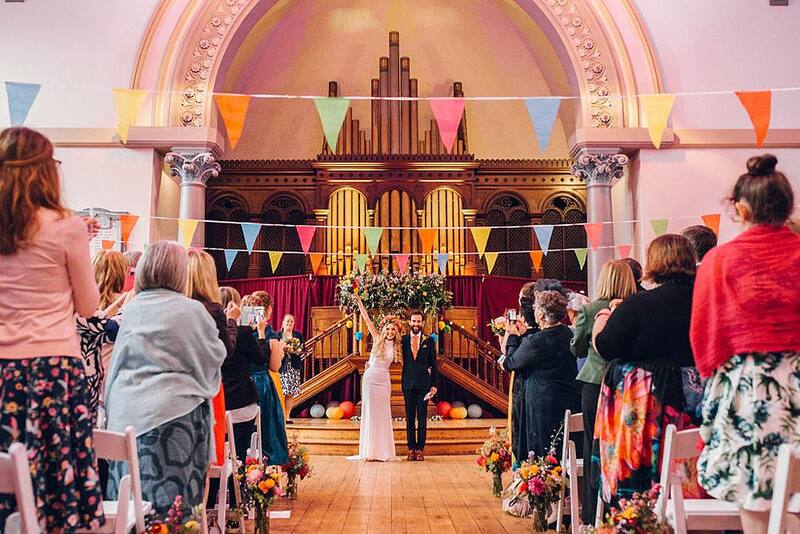 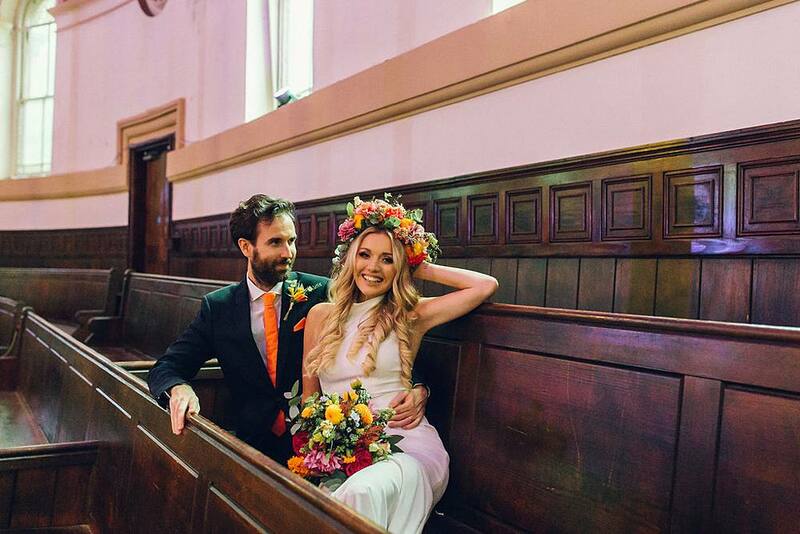 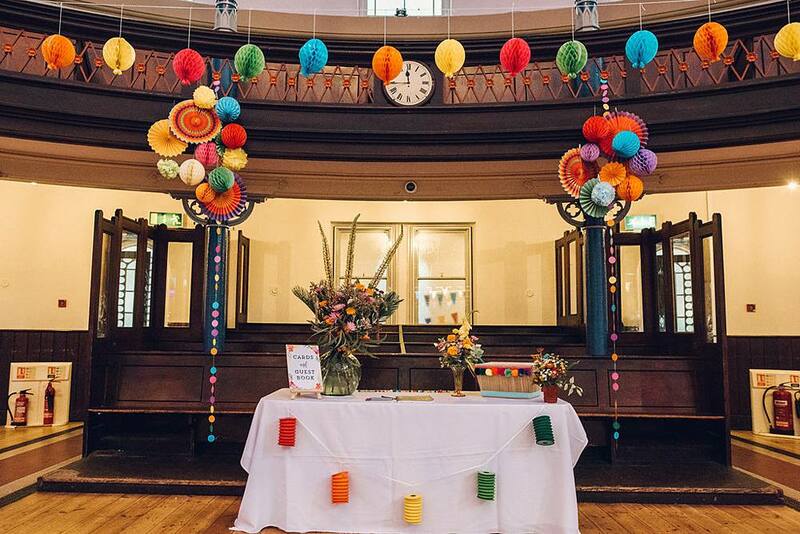 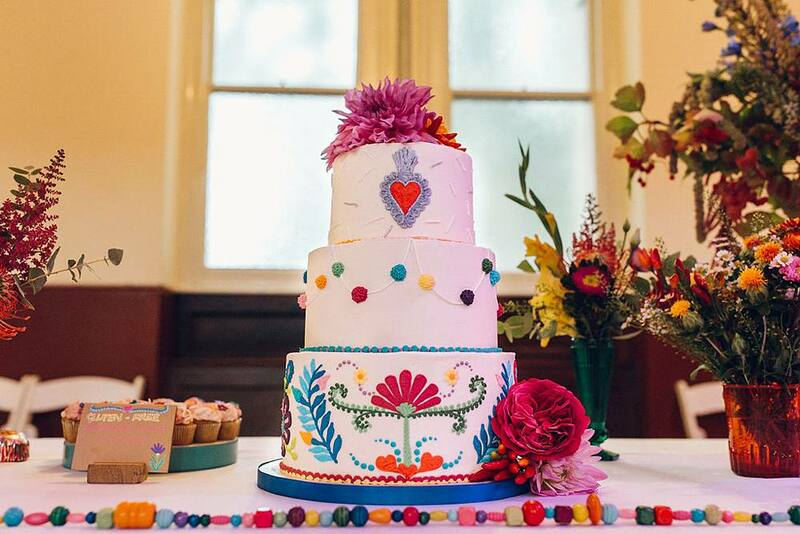 The couple got engaged in Mexico, so they wanted to replicate the fun, colourful festival atmosphere at their wedding (however were careful to steer clear of anything Day of the Dead themed). 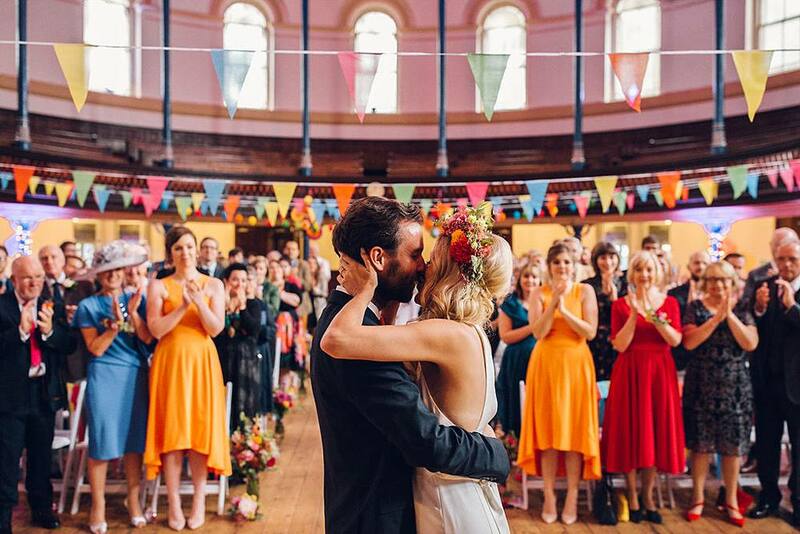 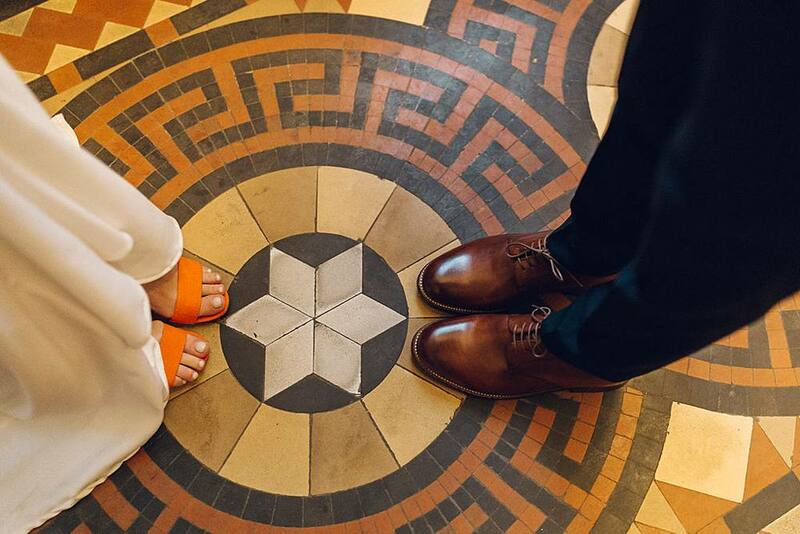 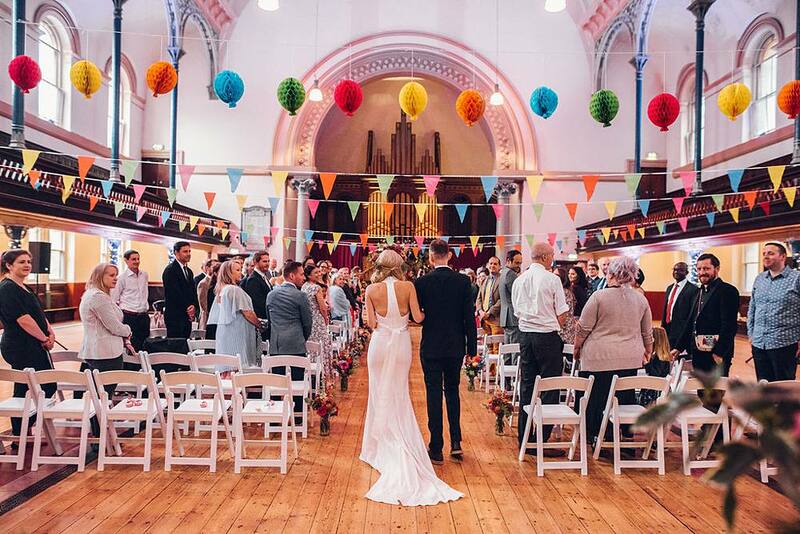 They wanted a relaxed and informal day, and the Round Chapel in Clapton was the perfect canvas to build that from. 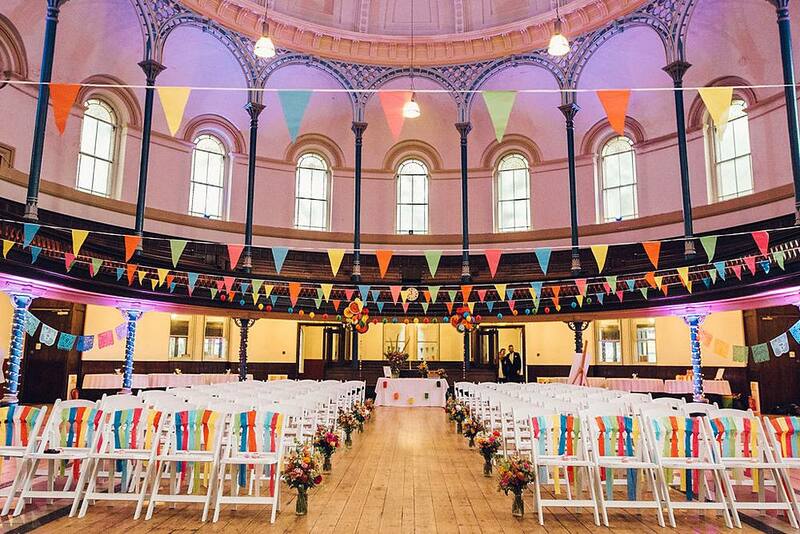 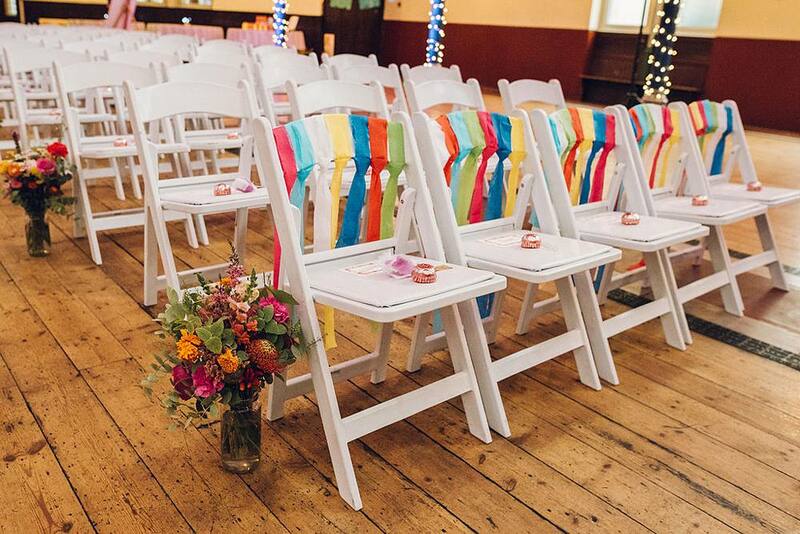 Their whole day and night was taking place in the same one room, so Kat planned the day wisely and tried not to have too many moving parts, despite the fact that the Round Chapel is a completely dry hire venue meaning everything, right down to the chairs, had to be hired in. 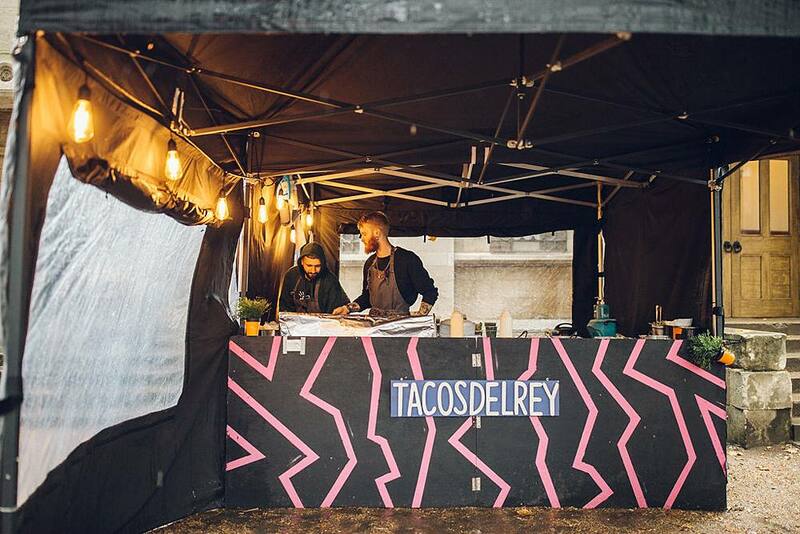 Food was an informal Mexican food truck outside, and a Mariachi band provided brilliant music to set their day off. 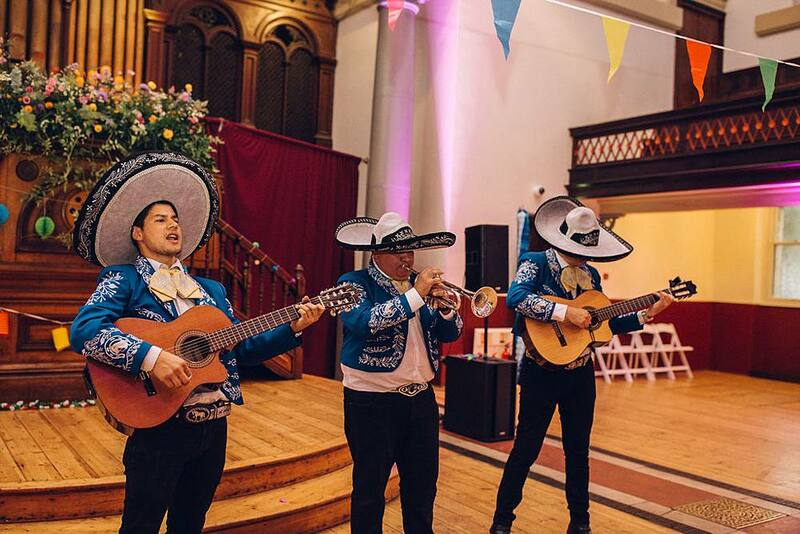 The Mariachi band was the perfect choice band-wise as they really lent themselves to the flow of the day since they could move around easily, depending on where the guests were and how the day rolled. 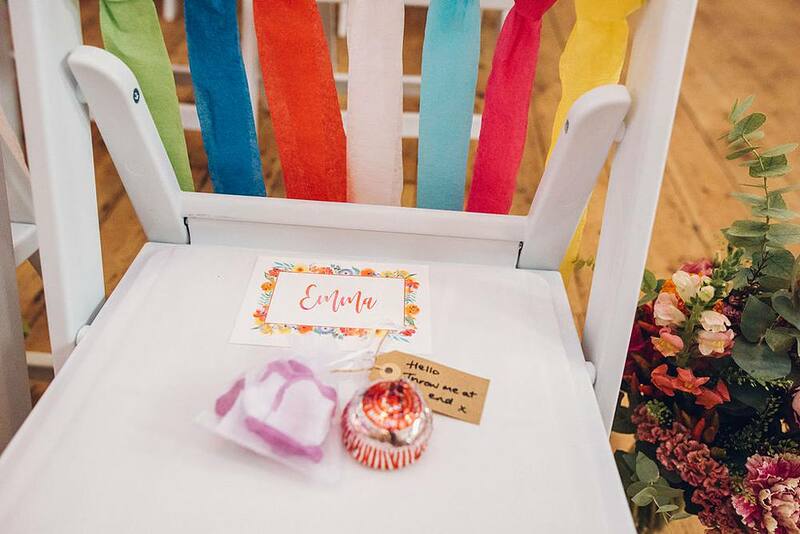 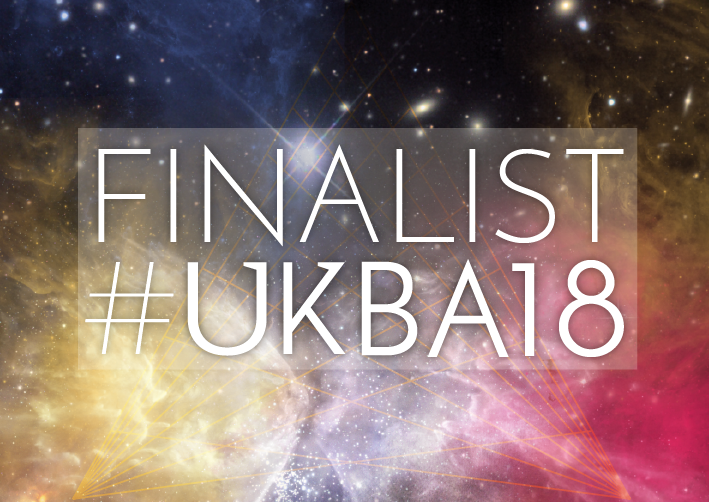 Kat spent weeks buying, collecting and making all the decorations herself, and Team Devine bride were hired to put it all together on the day and manage the running order and suppliers. 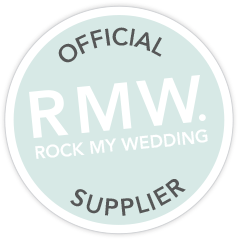 My team and I was there from early doors the day of the wedding, accepting all the deliveries, doing all the décor, setting up, and directing suppliers – however this would not have been possible without the amazing help from the groom, bride’s dad, and some other close friends and family who were an amazing little army helping with everything that morning too before they had to dash off and get ready themselves. 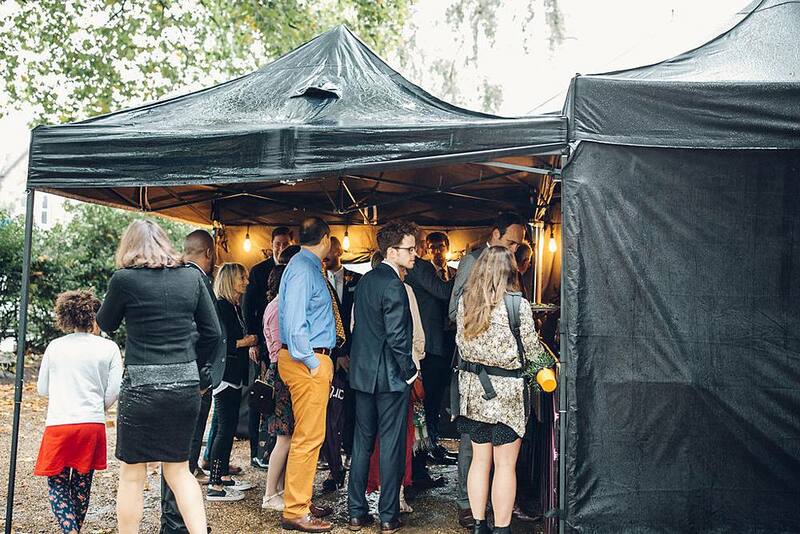 The weather was torrential that day, so we had a few brolly dashes to get the bride in and out and in again secretly pre-ceremony, and we managed to organise last minute for the Killa Dilla to bring a pop up gazebo so guests didn’t get wet when they were going for food. 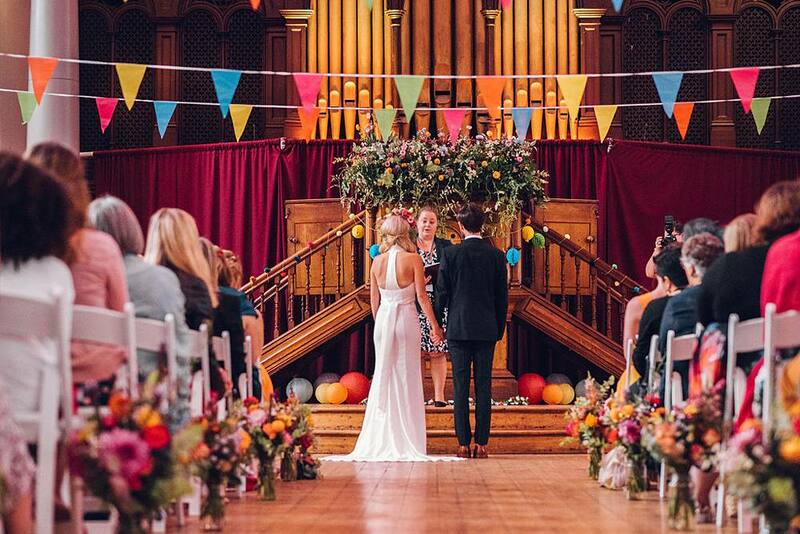 Aside from that, it was the perfect venue for a rainy-day wedding, because the heart of the wedding was the main hall and each part of the day was centred around it (so there was no other travelling for guests once the day began), and we brought sunny Mexico to rainy England with a rainbow of amazing décor and stunning flowers by Eliza Honey (who is actually Mexican, so absolutely nailed the flowers!). 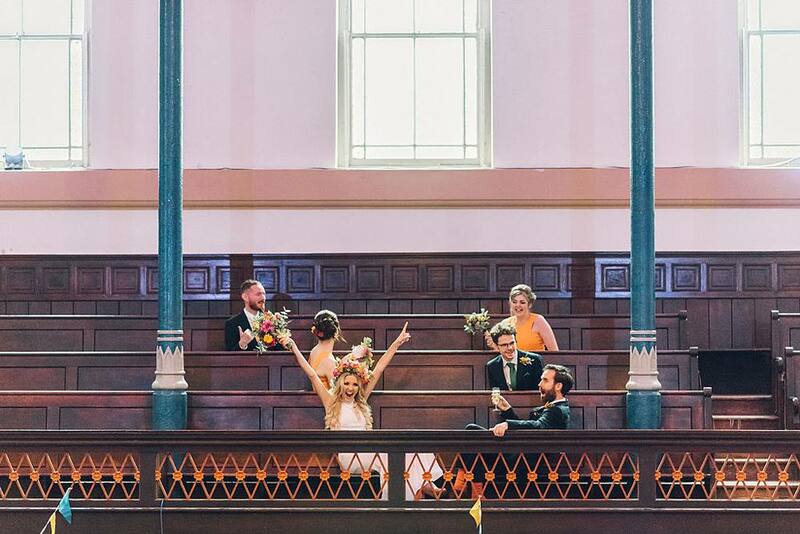 After the ceremony, guests filtered out to the atrium for drinks while Team Devine Bride quickly rearranged the ceremony seating into an informal dining area while the Mariachi band played for guests. 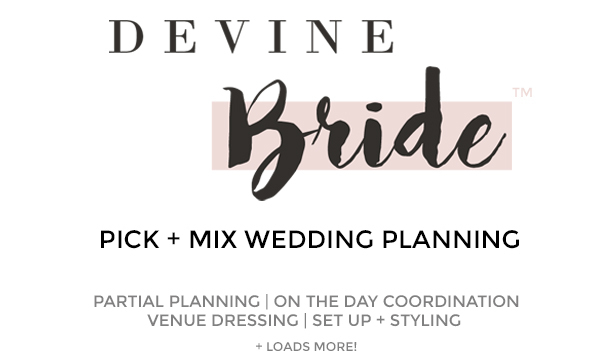 The rest of the day was then carefully managed and hosted by Team Devine Bride. 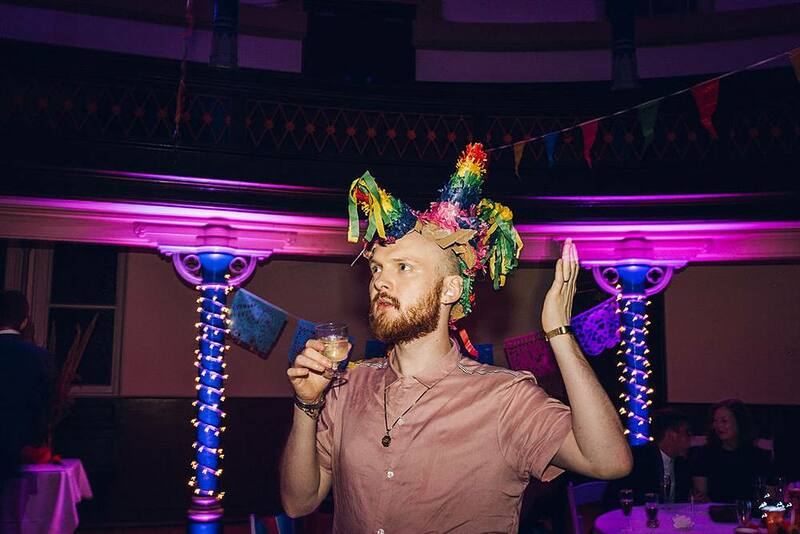 After some more drinks and some photos, food was served and guests filtered out by table to get tacos. 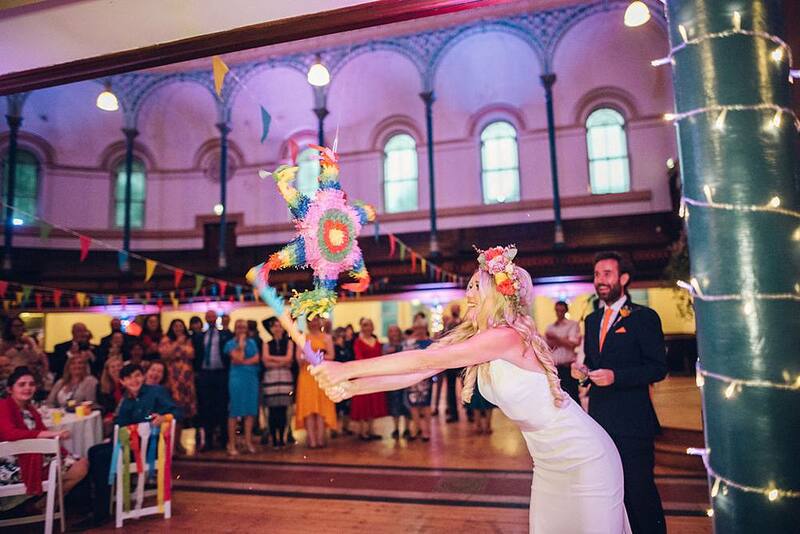 Speeches were done at the alter shortly afterwards, and then the cake was cut, the pinatas were smashed, and the party started! 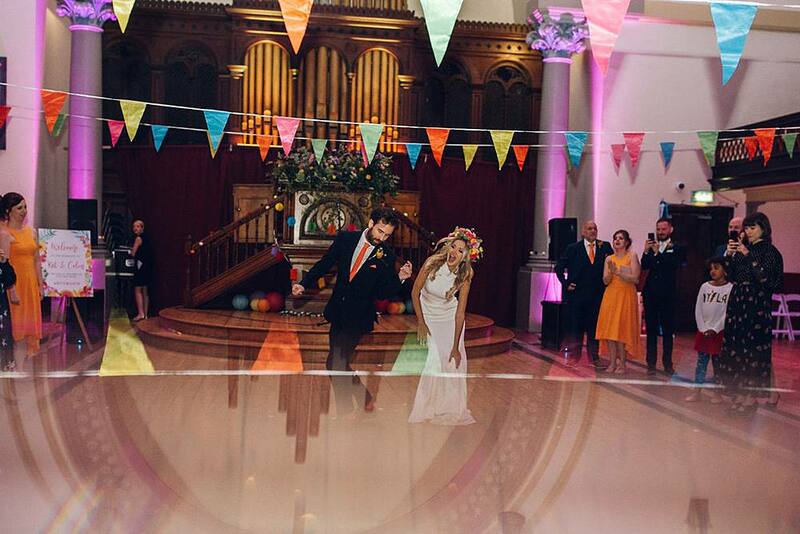 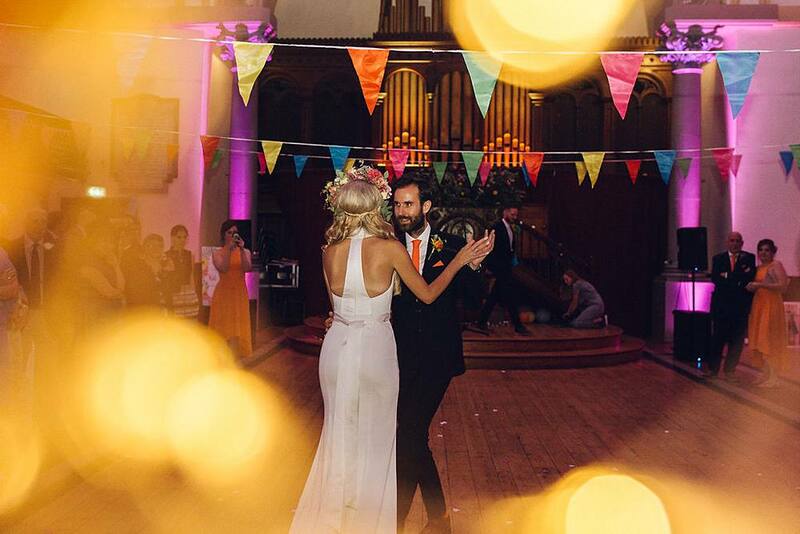 The couple played music from their own playlists for their reception, and had the perfect platform for their dancefloor: surrounded by columned fairy lights, on exactly the same spot they had been married earlier in the day – it was the perfect setting for their colourful festival wedding, and it was quite the party. 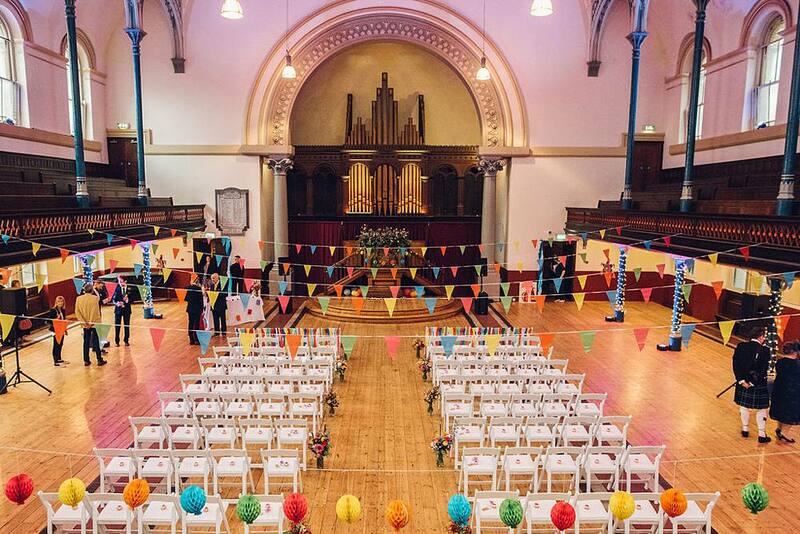 No one got wet and we almost forgot we were in rainy Hackney! 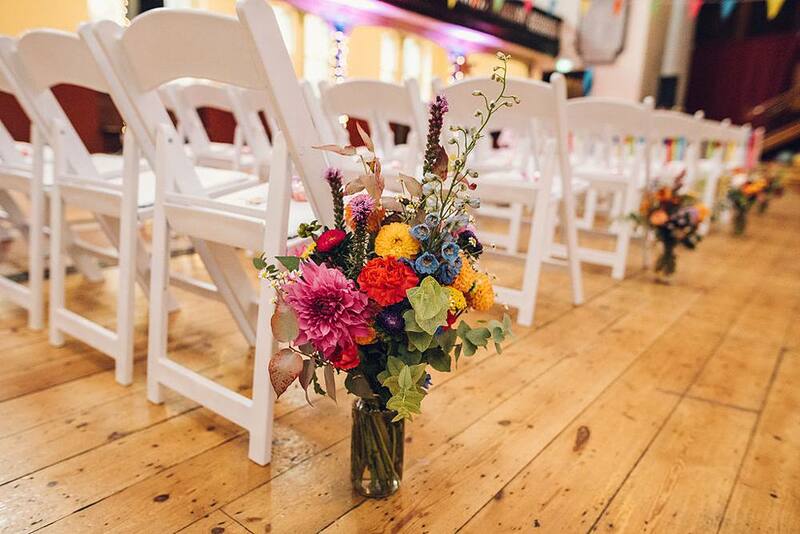 Wedding Day Management and Coordination, inc Décor, Set Up and Take Down Service, by Devine Bride. 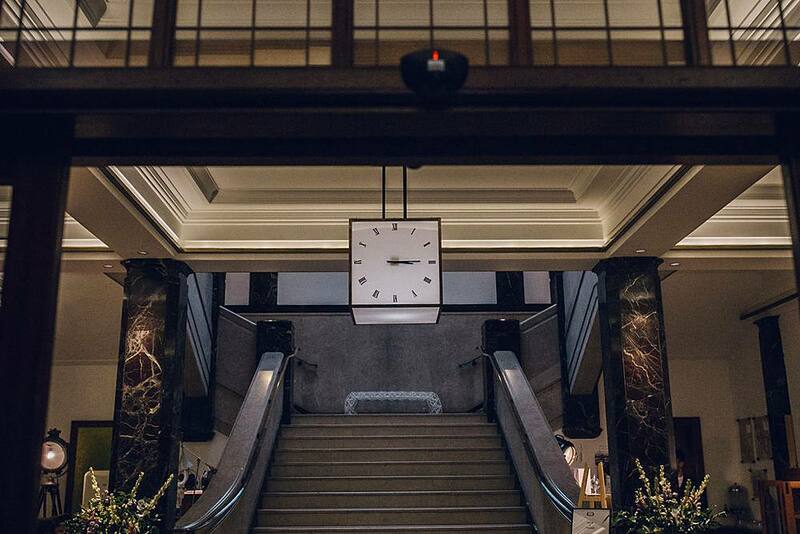 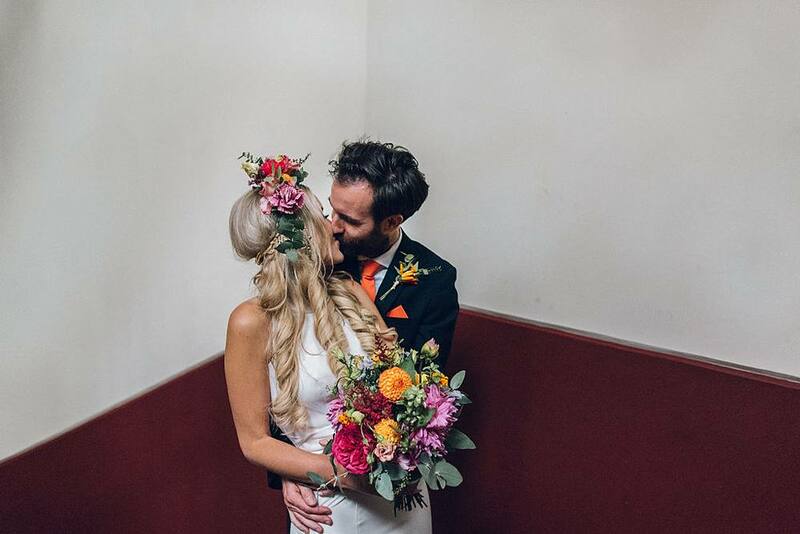 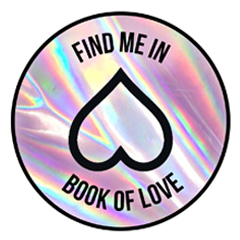 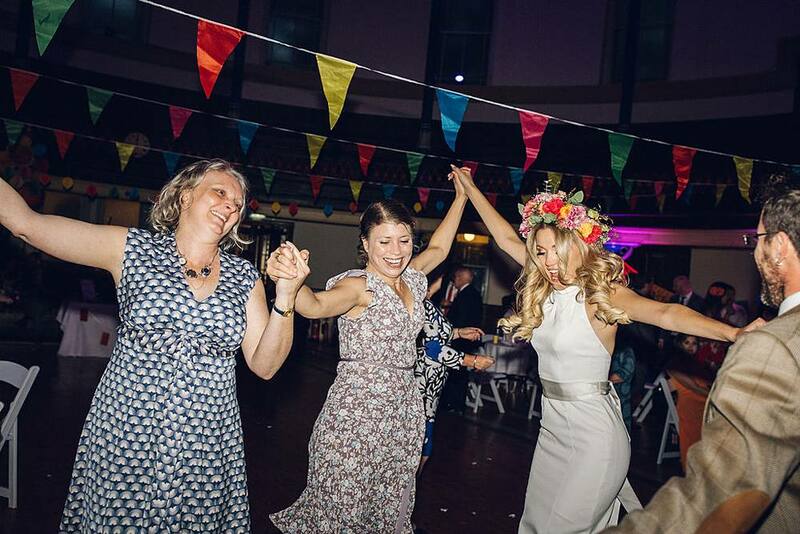 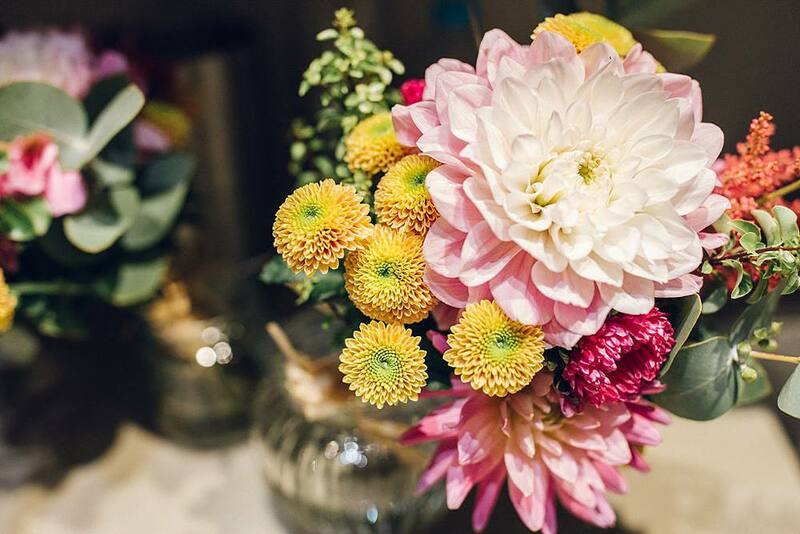 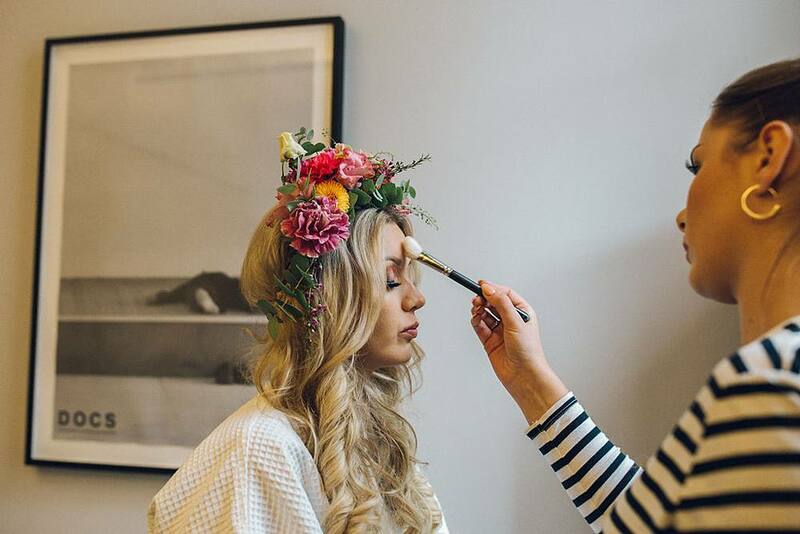 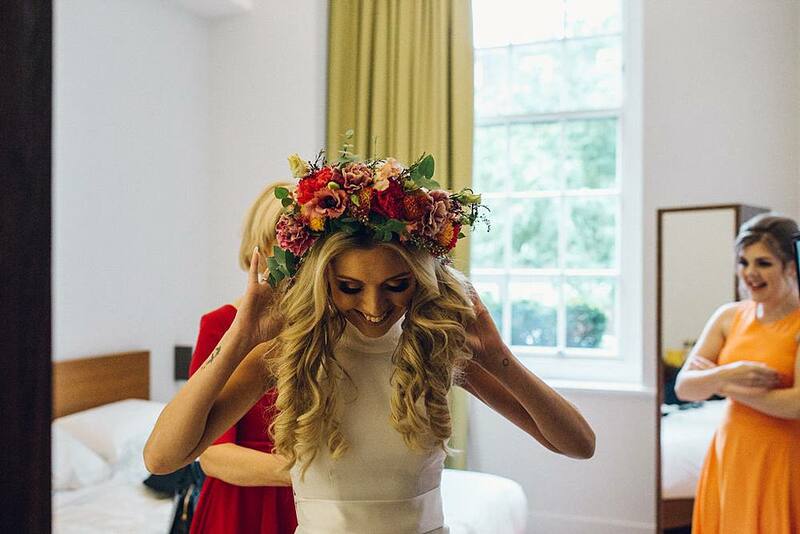 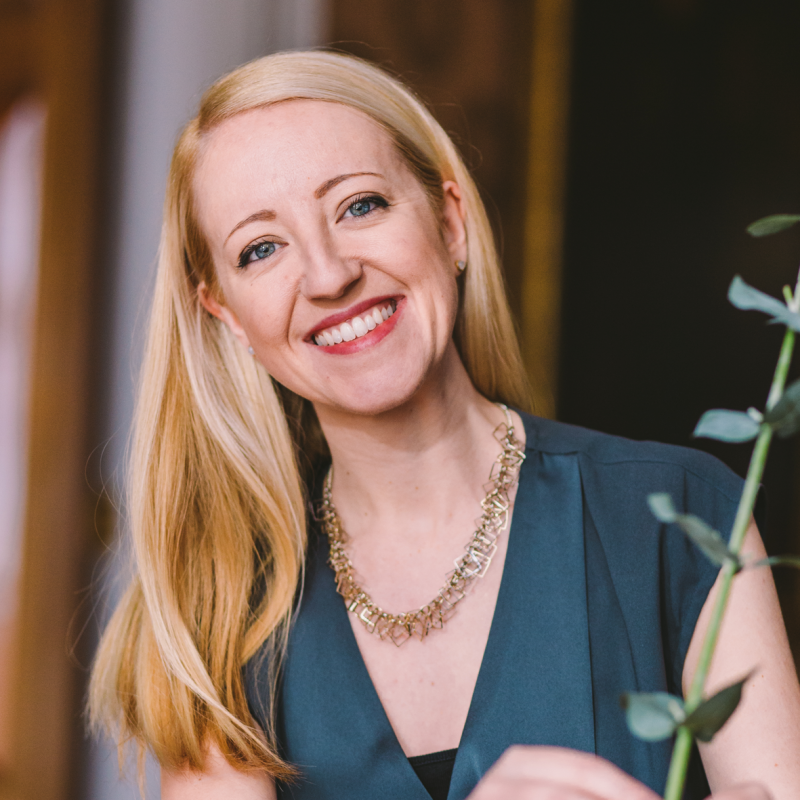 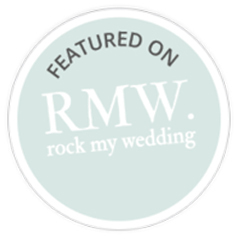 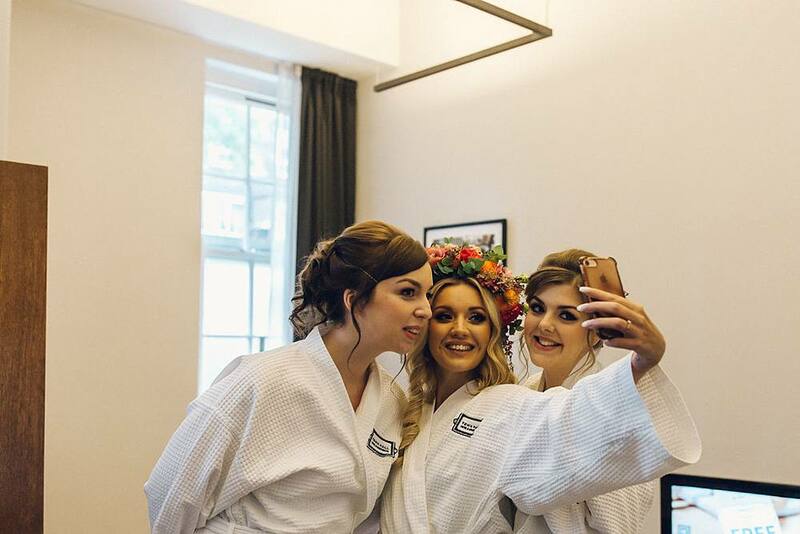 “We met Laura at a wedding fair, where she stood out from the confusing and often scary crowd as confident, friendly and knowledgeable, with an impressive list of very happy clients. 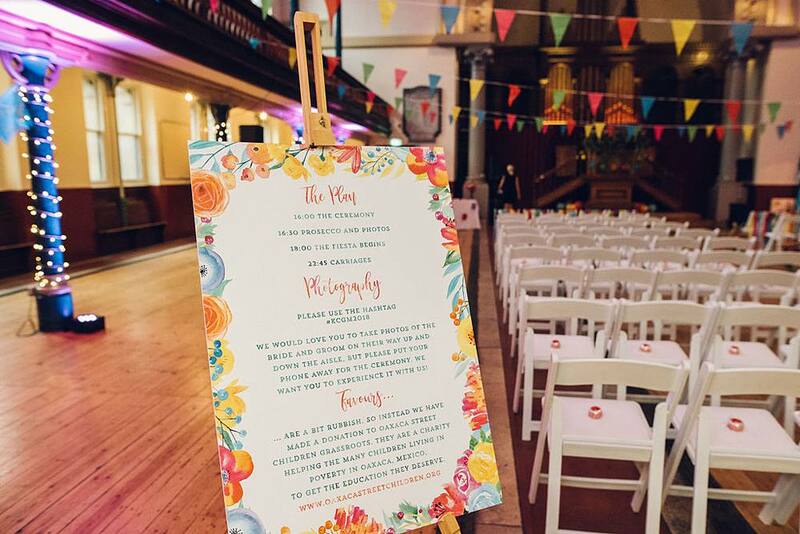 As an events manger myself I was very nervous handing over such an important and personal event to a stranger, but well before the day I had total faith that Laura would deliver exactly what I wanted – her briefing documents are a thing of wonder! 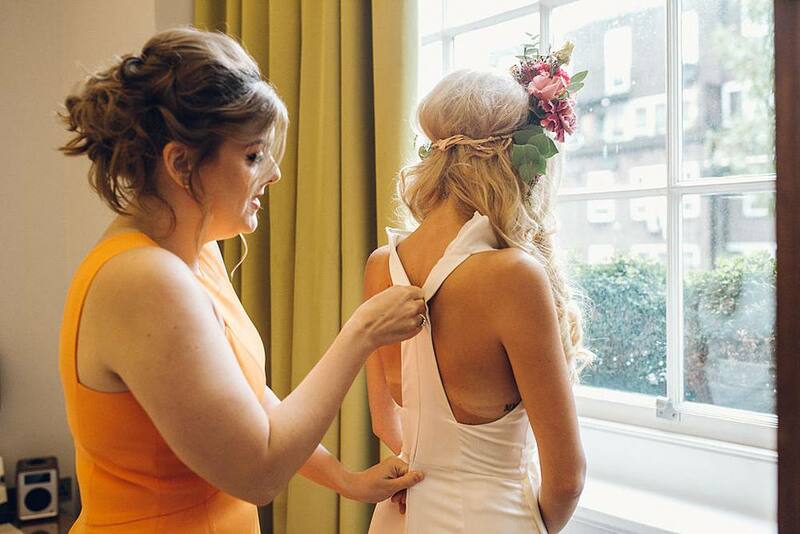 Despite us only booking her to coordinate on the day (an option on her ‘pick and mix’ service) she was more than happy to lend advice and recommendations in the lead up (she knows everyone worth knowing in the wedding biz), with quick and reassuring responses.